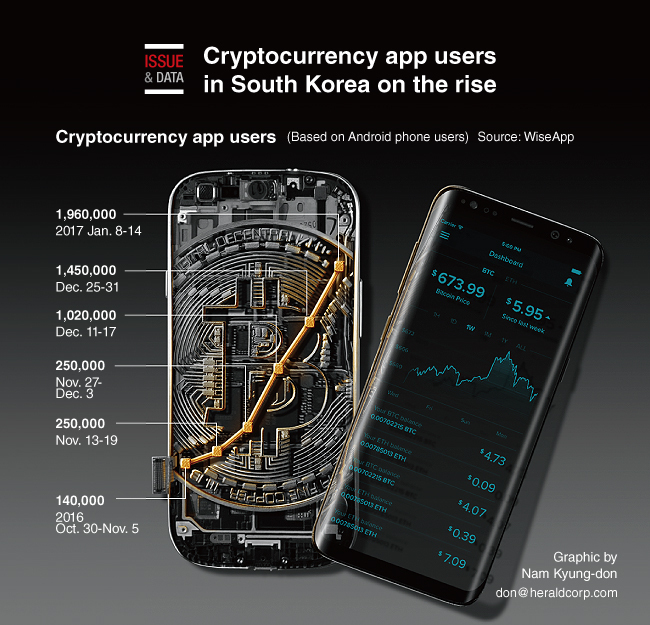 The number of cryptocurrency app users in South Korea has increased by 14 times in the last 14 weeks to approximately 2 million users, according to data. A total of 1.96 million people are estimated to have used cryptocurrency apps on their smartphones, based on app analytics company WiseApp’s analysis of 23,000 Android smartphone users in South Korea. In addition, the company found that 6.5 percent of bitcoin app users are in their teens, 24 percent in their 20s, 32.7 percent in their 30s, 21 percent in their 40s, and 15.8 percent are 50 and over.